Sugar-coat the tie of soul within you and your loved one by gifting the individual this Enchanted Blossoms in a Lustrous Arrangement. 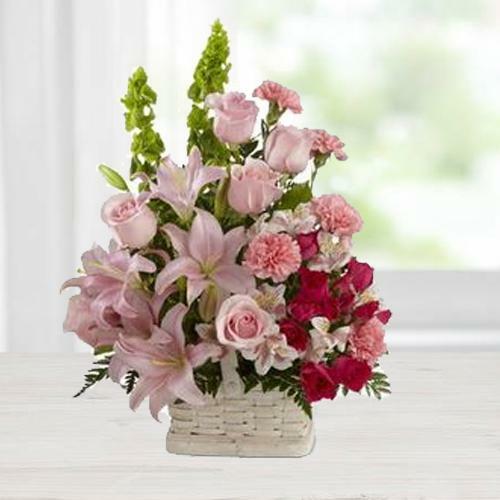 Varied mind-absorbing Blossoms like Pink Lilies (3), Red Roses (4), Pink Roses (4), and Pink Carnations (5) are presented in this Arrangement. Sugar-coat the tie of soul within you and your loved one by gifting the individual this Enchanted Blossoms in a Lustrous Arrangement. Varied mind-absorbing Blossoms like Pink Lilies (3), Red Roses (4), Pink Roses (4), and Pink Carnations (5) are presented in this Arrangement with Small Cadbury Celebration. Sugar-coat the tie of soul within you and your loved one by gifting the individual this Enchanted Blossoms in a Lustrous Arrangement. Varied mind-absorbing Blossoms like Pink Lilies (3), Red Roses (4), Pink Roses (4), and Pink Carnations (5) are presented in this Arrangement with 1/2 kg Kaju Katli.